BDS EN 197-1:2003,CEM II/B-M (S-V-L) 42.5N. Reduces heat of hydration which protect cracks. 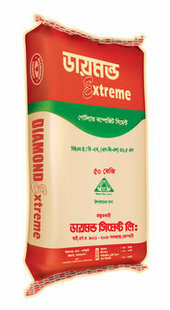 Diamond Extreme gives strong & durable concrete as compared to other cements in the markets As this cement contains fewer amounts of alkali, magnesia & free lime, it gives long term strength & durable concrete. Concrete mix with Diamond Extreme generally requires less water usually between 5 & 10 % by comparison with OPC mix. gives higher strength. PFA & Slag particles work like a ball bearing around coarse cement particles. This increases the workability & eases placing of the concrete. PFA & Slag act like a plasticizer. Mass Concreting and all types of RCC structures. Commercial, Industrial & Residential structures.